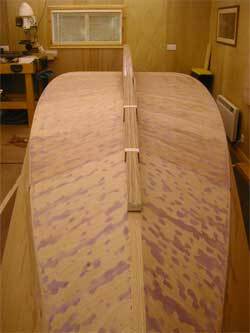 Now for the mid keel section, again laminated from 6mm ply. 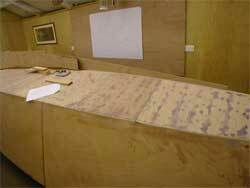 Same procedure to get the hull profile, cut over size and scribe off the hull. For trimming the curverd profile I use my second favorite plane, after the block plane, a circular plane, available from Rutlands. Here's all the mid keel sections in position. 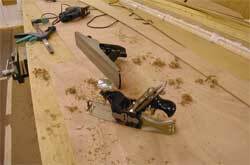 The next task is to glue 6 of them together and thickness them down to size then add the two shorter outer lengths and bond them all to the hull. However, before I do that I need to complete the forward section of the keel.